Andre Russell celebrates his century. 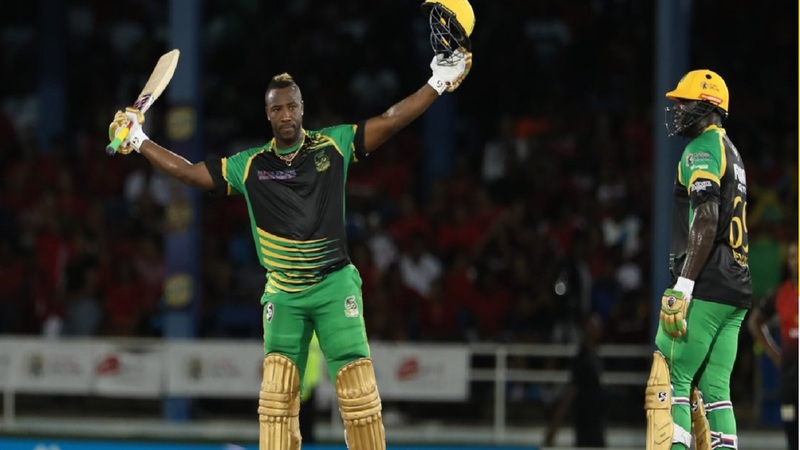 Andre Russell enjoyed a sensational first outing as Jamaica Tallawahs captain on Friday night at the Queen’s Park Oval in Port-of-Spain as he claimed a hat-trick and a record 40-ball hundred in the Hero Caribbean Premier League (CPL). Russell cemented his place as one of the best Twenty20 all-rounders in the world with a stunning display, guiding his side to an unlikely four-wicket victory over Trinbago Knight Riders with three balls to spare in a record chase. The 30-year-old had taken some punishment in his opening three overs as the hosts reached 216-3 before Russell stuck with a hat-trick as Trinbago posted 223 for six. Russell removed Brendon McCullum, Dwayne Bravo and Denesh Ramdin in the final over, the latter holing out in the deep to Andre McCarthy. The Tallawahs' reply was stuttering at 41-5 when Russell arrived at the crease, but – after being dropped early - he promptly set about the Knight Riders bowlers in brutal fashion. Twelve sixes in his first 40 balls helped him race to three figures faster than anyone else in the competition's history, the milestone reached with a huge drive over long-off in the 17th over. "First game of captain at this level, it was a good start and I'm going to enjoy while it lasts," said Russell, who finished unbeaten on 121. "The hard work has been playing off and I'm happy I could contribute big for my team." Russell found a willing ally in Kennar Lewis, who made 52 from 35 in a 161-run partnership, but this was all about one man. Remarkably, Russell is the second man to take a hat-trick and score a hundred in the same T20 match, England’s Joe Denly having done so for Kent only last month in the Vitality Blast. Having blasted a Queen’s Park Oval record 195/6 in the opening game of the tournament 48 hours ago, TKR obliterated that mark with their 223/6. For two hours, it stood as an all-time Hero CPL record. A power-packed Knight Riders batting line-up sent 14 sixes over the boundary ropes – astonishing at the time but later put firmly in perspective by Russell’s one-man wrecking mission. The Knight Riders’ innings was build between the New Zealand pair of Colin Munro and Brendon McCullum both blasting half-centuries, with McCullum’s particularly dramatic. Munro backed up his 68 in the opener with 61 from 42 balls here, but it was McCullum who sent an already imposing total truly stratospheric. Having struggled to 7 not out from his first 12 deliveries, McCullum smashed a further 49 from his next 14 balls to propel the score well beyond 200. Nine of those 14 balls, starting with a generous and extremely costly full-toss from Kemar Roach, went to or over the boundary in a blitz that left the Tallawahs shell-shocked. The 19th over, Roach’s fourth over, brought 30 runs – 29 of them from the flashing blade of McCullum, including a six that came desperately close to winning him $20,000 for hitting the Sunshine Snacks target positioned beyond the boundary at midwicket. Russell then took the responsibility of bowling the final over and dismissed McCullum before bowling Darren Bravo and having Ramdin caught in the deep to complete a hat-trick. It would turn out to be only the very start of Russell’s game-changing night. 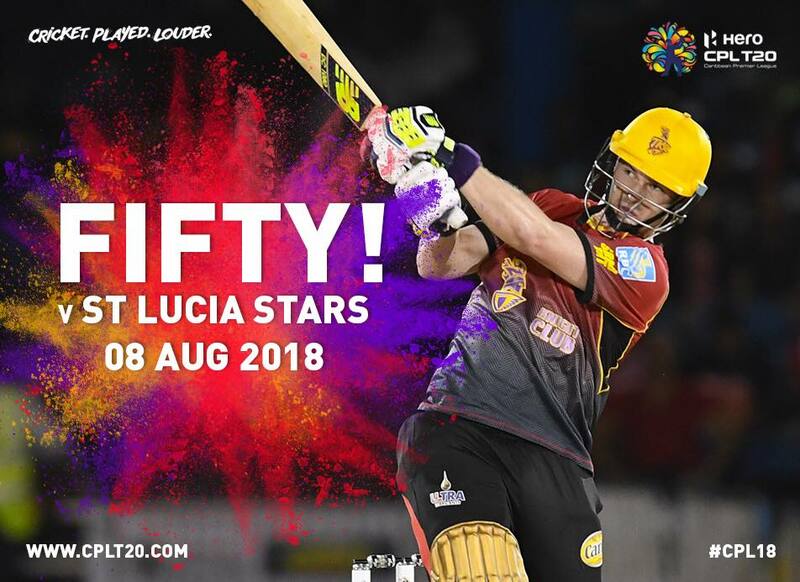 The early impetus in the TKR innings had come from Chris Lynn, who plundered 46 from 27 balls and shared a 30-ball 50 partnership with Munro, while McCullum was ably supported by Darren Bravo (29 from 16) during the late carnage. Only the spinners managed to escape the worst of the punishment, with Imad Wasim conceding just six runs in a two-over spell with the new ball and ending with figures of 1/23 that would look more significant still when the final reckoning came, while Aussie leg-spinner Adam Zampa’s four overs yielded 1/35. Any hope the Tallawahs harboured of chasing the total down appeared to have been shattered within the first three overs of the run-chase as Ali Khan ripped out three wickets in six balls. Glenn Phillips and Andre McCarthy were caught in the first over, but best of the lot was a rapid nip-backer that was too quick for the vastly experienced Ross Taylor, trapped plumb in front for just a single. Shannon Gabriel bowled Rovman Powell off a bottom edge in the next over, while Fawad Ahmed struck with his very first ball for the game in a row when he trapped Johnson Charles lbw with a googly for 24 to leave the game seemingly done and dusted at 41/5. But in strode Russell to be promptly dropped by Ali Khan at deep midwicket. The rest is history. 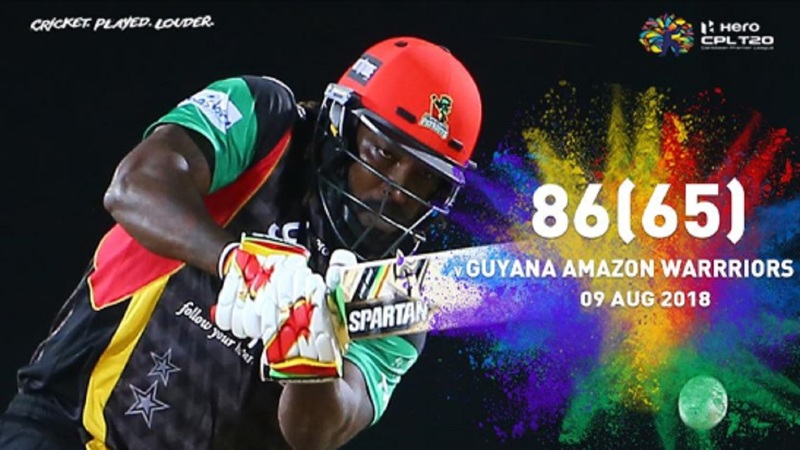 Summarized scores: Trinbago Knight Riders 223/6 (Munro 61, McCullum 56, Lynn 46, Russell 3/31) vs Jamaica Tallawahs 225/6 (Russell 121*, Lewis 52, Ali Khan 3/24, Fawad Ahmed 2/46). 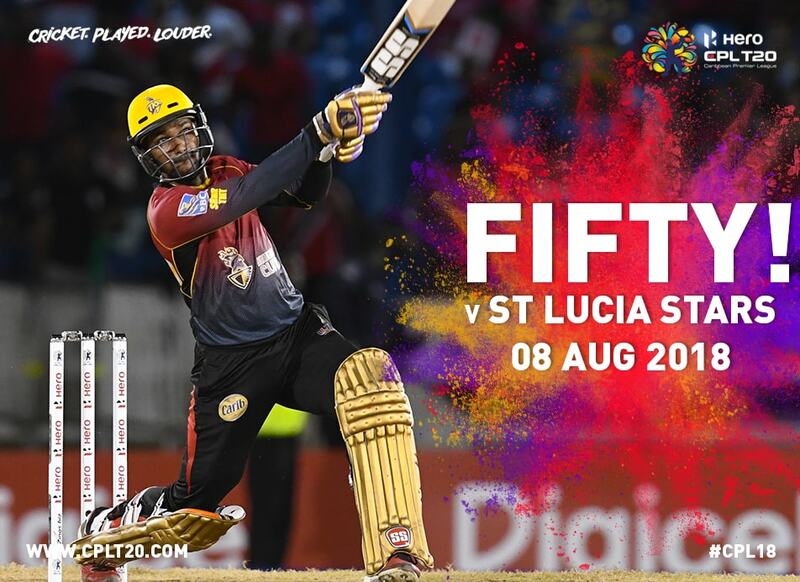 (2) Trinbago Knight Riders v St Kitts & Nevis Patriots (8pm), Queen’s Park Oval.